Speculation about Bruce Jenner’s gender transition is in celebrity news a lot lately and I’m disturbed by how most of these articles are treating them. As Jenner was assigned the male gender at birth and is possibly now identifying as a woman (frankly, I don’t know this for a fact, nor do many of the articles describing them as transitioning) I will refer to Jenner as they and them throughout this article. Pronouns matter, so let’s talk about them. (And for anyone thinking “It’s just celebrity gossip, ignore it!” – you may be underestimating the power of this kind of tabloid-y mainstream media to have quite an influence on what people think and feel. The influence is vast – just look at the number of shares on the People article). While it’s amazing and inspiring that their family is supporting them, even the “family insider” is referring to them as “he” and “him.” As a result, so does the writer of the article (and many others). The article has a veneer of trans acceptance and respect for Jenner’s choices while taking no care to justify the use of the male pronouns or explain the disjunction between the fact that they are going to live as a woman, as reported, and continually describing Jenner in male terms. This kind of approach – treating a transitioning gender identity or expression as something put on or added, superficially, like clothing or make-up, to a base identity that hasn’t actually changed – is not respectful of trans people and identities. The other side of this is, perhaps, that Jenner is expressing their gender in a different way lately that is more on the spectrum of feminine expression. That doesn’t necessarily mean they are a trans woman, and readers should be mindful not to assume that every man who expresses things traditionally linked to femininity, or every woman that expresses things traditionally linked to masculinity, is trans or has the intention to transition to living as a different gender. Gender identity and gender expression are linked but are, indeed, two different concepts. There is no single or “right” way to express gender. 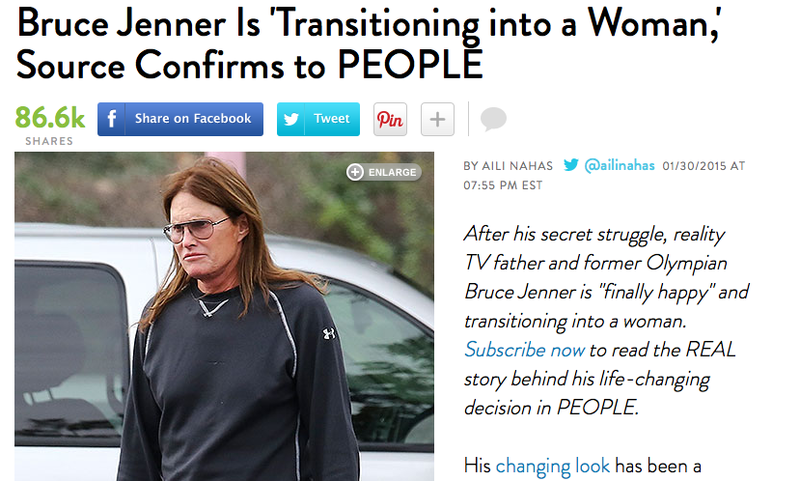 The other issue here is how our society doesn’t seem to know how to deal with a person in transition. The last few years have involved a great deal of increased awareness of transgender issues and trans visibility. There is a growing contingent of trans celebrities. A lot of publications covering stories about trans people on a superficial level don’t seem to know what to do when their gender isn’t conforming to the gender binary. They can figure out “woman who was assigned male at birth” (often explained, horribly, as “biologically male”). So while people seem to be getting over their prejudicial hang-ups and at least accepting, if not understanding, trans identities, comprehending the potential transition of a 65-year-old, who has long been known in the public eye as male, is somehow baffling. People in transition deserve the same respect as someone who has already transitioned – not that transitioning is necessarily some sort of Point A to Point B finite process for many people. If you wouldn’t call a transwoman celebrity who has been living as a woman for 10 years “he” or “him,” why is Jenner being treated differently? Because they are transitioning later in life? Because they haven’t (yet or publicly anyway) changed their name to something that screams woman? Because you knew them as Kim Kardashian’s stepfather? Rule number 1 for me as a writer is to respect and honour the preferred pronouns of the person in question, and to ask respectful questions to seek direction on how to best and most accurately portray the person’s identity and expression. Bruce Jenner’s gender identity and expression may not be obvious or neat and tidy at the moment, and it doesn’t need to be. They may identify within the binary as a woman, or maybe more gender fluidly. Either way, if their preferred pronouns cannot be gleaned directly from them, writers should take care to reflect on how to most respectfully describe Jenner, and note that pronouns should reflect a current gender identity, not the past. And until Bruce Jenner discusses their gender identity and possible transition publicly, it’s really none of our business and the speculation pieces really should give it up. Their gender transition is not a spectacle for our consumption.